Part of the fun of reading YA novels these days is seeing the breadth of choices available for young people. When I was that age, we were rather limited as to what could be fit on a stone tablet. Today, however, the options for young adults seem to be infinite. As such, distinguishing yourself as an author becomes harder and harder. 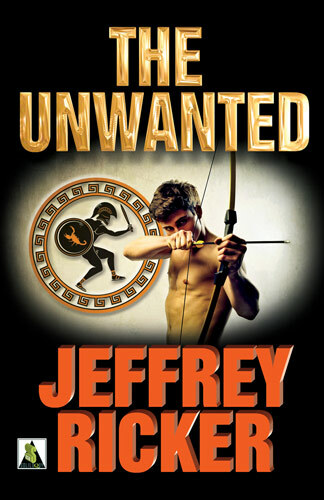 But Jeffrey Ricker has a chance to do just that should he continue in this genre, and his most recent book, The Unwanted is a fine start. Jamie Thomas is not having a good day. He’s been beaten up by his nemesis, Billy Stratton, rescued by his best friend Sarah, his car’s in the stop, and his mother is an Amazon. Not that she’s been around much. She abandoned him shortly after birth, leaving him in the care of his father, so why is she–and her horse–in their backyard? Well, she needs his help. Seems Jamie is the object of a prophecy indicating he alone can save the Amazonian race from destruction by Ares and his undead hoardes. Together with Sarah, his bully Billy (whose mother is also an Amazon), and his father, they attempt to fulfill the prophecy. Ricker’s first novel, Detours, although well-written and interesting, was less focused than it might have been, but he’s definitely learned his lesson here. The Unwanted is as sharp and laser-tuned as you could ask for. Steeped as he is in Wonder Woman lore and mythology, Ricker creates an extremely credible fascimile of the home of the Amazons, but all the mythos never gets in the way of the characters. Jamie is an interesting hero, as uncertain and flawed as he is innately brave. He understands the risks as well as what’s at stake, and his nascent love affair with Billy is both tender and believable. Jamie’s mother, Maia, is also well-drawn, always conscious of protecting her offspring at the same time she protects her race. The Unwanted even has visits from goddesses such as Athena and Artemis, who are sufficiently portentious and obscure. The ending, however, is where Ricker really shines. Giving such an epically heroic story its due HEA would be both rote and expected, but Ricker goes one up and delivers a HEA that’s not really a HEA. Or is it? That depends on which side of the story you look. Are the villains defeated? Well, er…yes. But beyond that, you shouldn’t stop reading and assume you know how things turn out. You’d be wrong. In short, Ricker has crafted a wonderfully satisfying story that not only does his love of Wonder Woman justice, but brings the Amazon myth alive for an entirely new audience. He draws back the bow. He shoots. And he scores.